CLINICA DE ENDODONCIA Y MICROCIRUGIA ENDODONTICA Doctor MALFAZ - ADVANCED ENDODONTIC AND ENDODONTIC MICROSURGERY CLINIC﻿ Our Office provides superior patient care First and foremost, we strive to help patients retain their teeth for a lifetime. Our office places a high priority on attending to your comfort, emergency needs, and follow-up care. A thorough medical history, dental history, and pre-treatment diagnostic protocol is standard to insure that you receive the most appropriate and thorough treatment. We also perform thorough follow-up and recall examinations when necessary.New TechnologiesOur office employs the most advanced technologies available to ensure your comfort and the best results as possible.Cone Beam Computed Tomography (CBCT):Our practice is the first limited endodontic specialty practice in Spain to employ this new high-resolution radiographic technology. Our new Kodak CS 9300 3D Premium provides very detailed three-dimensional digital radiographs of the jaws to image areas of interest with greatly reduced radiation when compared to others CBCT units.Digital Panoramic Radiography: Our new Kodak CS 9300 3D Premium equipment has two options, one dedicated to producing CBCT images and a second for surveying the entire mouth in a very high resolution panoramic radiograph.Intraoral Digital Radiography: All radiographs are taken with digital sensors, providing instant viewing on our computer monitors while significantly reducing radiation levels compared to film-based x-rays. This technology also allows for secure electronic transfer of medical information to our patient’s co-therapists.Operating Microscopes:Specialized operating microscopes are used during all phases of your endodontic treatment. Magnification and fiber optic illumination enable us to see small-often missed-details such as calcified canals and fractures. Our practice is one of the first limited endodontic specialty practice in Spain to employ this Specialized operating microscopes.﻿ Simon JH, Enciso R, Malfaz JM, Roges R, Bailey-Perry M, and Patel A. Differential diagnosis of large periapical lesions using cone-beam computed tomography measurements and biopsy. Journal of endodontics 32(9):833-7, 2006 Cohenca N, Simon JH, Roges R, Morag Y, and Malfaz JM. Clinical indications for digital imaging in dento-alveolar trauma. Part 1: traumatic injuries. Dental traumatology. 23(2):95-104, 2007 Cohenca N, Simon JH, Mathur A and Malfaz JM. Clinical indications for digital imaging in dento-alveolar trauma. Part 2: root resorption. Dental traumatology. 23(2):105-13, 2007 Malfaz JM.﻿ Applications of the microscope in current endodontics. RCOE, May-June 2002, vol.7, no.3, p.301-310. First and foremost, we strive to help patients retain their teeth for a lifetime. Our office places a high priority on attending to your comfort, emergency needs, and follow-up care. A thorough medical history, dental history, and pre-treatment diagnostic protocol is standard to insure that you receive the most appropriate and thorough treatment. We also perform thorough follow-up and recall examinations when necessary. Our office employs the most advanced technologies available to ensure your comfort and the best results as possible. Our practice is the first limited endodontic specialty practice in Spain to employ this new high-resolution radiographic technology. 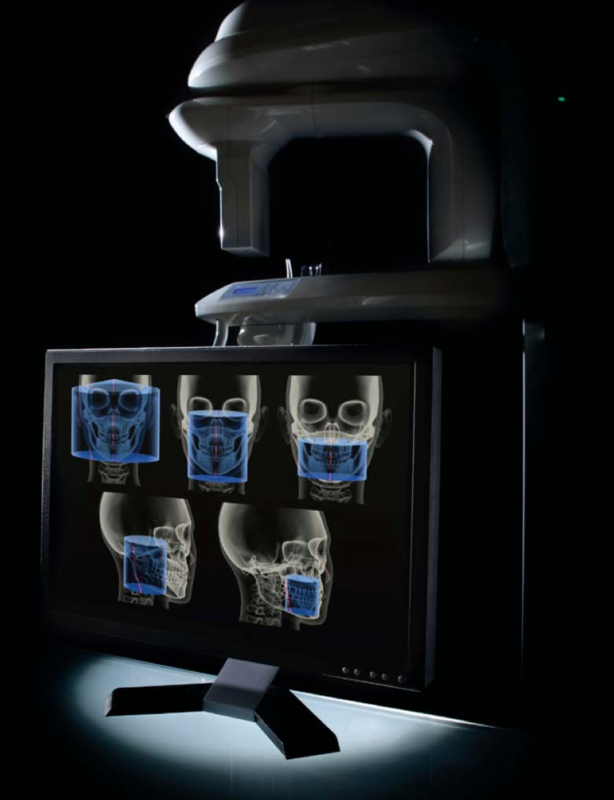 Our new Kodak CS 9300 3D Premium provides very detailed three-dimensional digital radiographs of the jaws to image areas of interest with greatly reduced radiation when compared to others CBCT units. Our new Kodak CS 9300 3D Premium equipment has two options, one dedicated to producing CBCT images and a second for surveying the entire mouth in a very high resolution panoramic radiograph. Dr. Jose-Maria Malfaz received his dental degrees from the Dental School University of Granada, Spain. He completed his specialty certificate in Endodontics at University of Southern California, USA, under Dr. James H. Simon. Also he graduated in Medicine and Surgery from the University of La Laguna, Tenerife (Spain), and earned a PhD degree in Medicine and Surgery from the University of Granada (Spain). He is Specialist Active Member of the American Association of Endodontists, Active Member of the Spanish Association of Endodontists (AEDE) and Member of the European Society of Endodontics (ESE). He is President of the Spanish Association of Endodontists (AEDE) and was President of the XXIX Annual Meeting of the Spanish Association of Endodontists (AEDE). He was awarded the American Association of Endodontists Resident Award in 2006. He has published clinical and scientific articles, and contributed to 3 chapter books in Endodontics. Dr. Malfaz teaches at different post-graduate (Spain, Italy and USA) and Continuum Education programs of Endodontics, and he has presented lectures and seminars in Endodontics at Universities and Dental meetings throughout Spain as well as Argentina, Costa-Rica, Ecuador, Venezuela, Paraguay, Peru, USA, Austria and Italy. 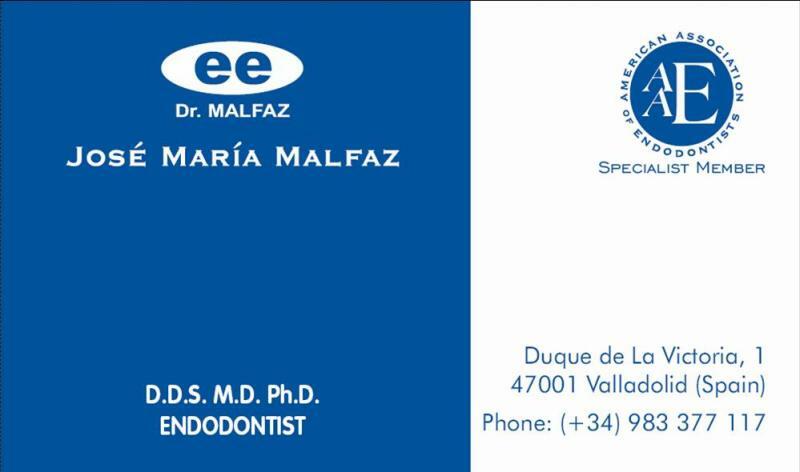 He maintains a private practice limited to Endodontics and Endodontic Microsurgery since 1994 in Valladolid, Spain. Endodontics is a specialty of dentistry that deals with diseases of the dental pulp and its supporting structures. Endodontists are dentists with special post-graduate training in this field. Endodontists are also experienced at finding the cause of oral and facial pain that has been difficult to diagnose. Although general dentists can perform endodontic treatment, patients are often referred to an endodontist when the case is complicated or more difficult than usual. In order to understand endodontic treatment, it helps to know something about the anatomy of a tooth. Teeth have several layers. 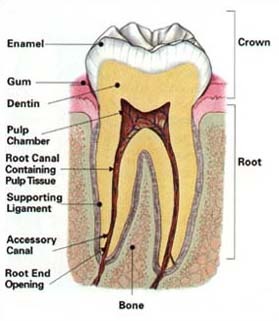 The outside layer of the tooth is composed of a hard layer called enamel. Enamel is supported by an inner layer called dentin, which has at its center a soft tissue known as the pulp. The pulp contains blood vessels, nerves, and connective tissue that are responsible for forming the s urrounding dentin and enamel during tooth development. The pulp receives its nourishment supply from vessels which enter the end of the root. 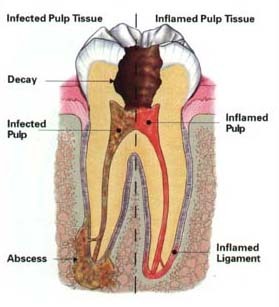 Although the pulp is important during development of the tooth, it is not necessary for function of the adult tooth. The tooth continues to be nourished by the tissues surrounding it even after the pulp is removed. Toothache pain is the main reason for patients seeking treatment. Fortunately, modern anesthetics can make the procedure pain-free in most cases. Seeking treatment early makes the procedure more comfortable, so don't wait. When caught early, treatment should feel no different than having a regular filling. For the first few days after treatment, there may be some sensitivity to biting pressure, especially if there was pain or infection before the procedure. If there are no contra-indications, 600mg of ibuprofen combined with 1000mg acetaminophen every six hours is recommended for 24 to 48 hours after the procedure. The typical inflammatory response peaks at 48 hours then subsides. Do not be alarmed if you feel your tooth a little more two days later. Your endodontist can prescribe other medications but they are rarely required.